Her reaction naturally changed to one of amusement and empathy, the moment I mentioned that the young man in question was my surgeon, and the immobilization was being strapped to the operating table! There is no untruth in the first story, but the discourse it calls forth depends on who the listener is, and evokes a substantially different discourse with the omission or addition of a few details. Had I told the same to my policeman neighbor, I’m sure a different automatic discourse would have sprung up for him, and he would have started to ask different questions, though, knowing him, I am sure he would have had a hearty, guys-will-be-guys laugh at the end. The key to the ultimate meaning of stories is intentionality. 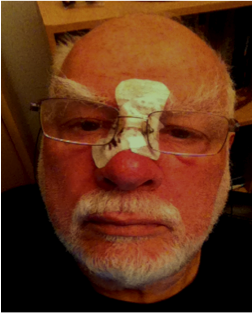 I was taking advantage of my strange appearance to lighten my pain and have a little fun. Understanding intentionality is the key to cultural competence, not just recognizing difference and learning to adapt behaviors to the situation. How can new media be used to shape discourse and create culture? We are forever telling stories, in old as well as new media. So, let’s move on from the question we discussed last time about what messages new-media themselves may bear. Let’s turn our attention to the second question, namely, how we use these media, deliberately or unconsciously to create, change or maintain certain forms of discourse as cultural building blocks. Can, for example, the interactivity of social media play an important role in reshaping cultural discourse and cultural identity? What has been done, accomplished, what is being done to create the stories that articulate today’s and tomorrow’s cultural realities? 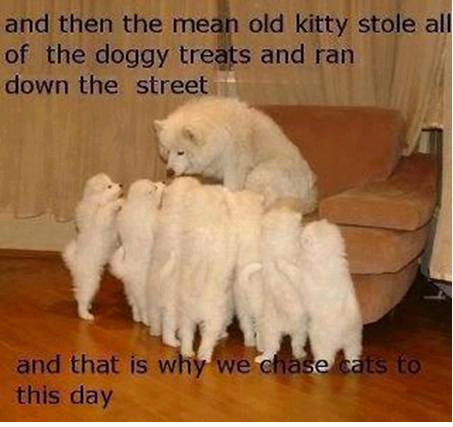 This doggy story is humorous, because it is so true. Patriots and dictators, oppressors and the oppressed each create their own story, not only of who they are but of how they are defined in reaction to others, usually seen as “the bad guys.” They expect mothers and teachers to pass it on. In the USA, when the Berlin wall came tumbling down and the Communist bloc shrank, after a brief period of euphoria, we started to need a real enemy to feel good about ourselves. There had to be some bad guys, some rustlers out there. Though it is not essential, identity myths pick up currency by emphasizing superiority, whether racial, moral, military or cultural as well as by identifying outside threats. Nonetheless, to discuss what is being done, or what we might do with contemporary media in this respect, it might be instructive to look at a classical case of rebranding, not of a product, but of a nation, something that occurred at a time when mass media could largely be described in two words: newspaper and radio. Dr. Hatice Sitki, a colleague in Australia, has done impressive work on the marketing and branding of national identity. If you think marketing is not relevant to cultural identity, think again. The whole idea of marketing is to create a discourse, which people take as their reality, a discourse that usually deals with them, sometimes with them as citizens, but more often today as consumers. Using a national example can tell us about commercial branding as well. What Hatice did was study the mythology, the brand, the discourse of Turkish identity, and connect it to the search for European identity, a topic that has been surfacing from time to time since the creation of the European Union—usually in times of stress, like the current financial crisis. 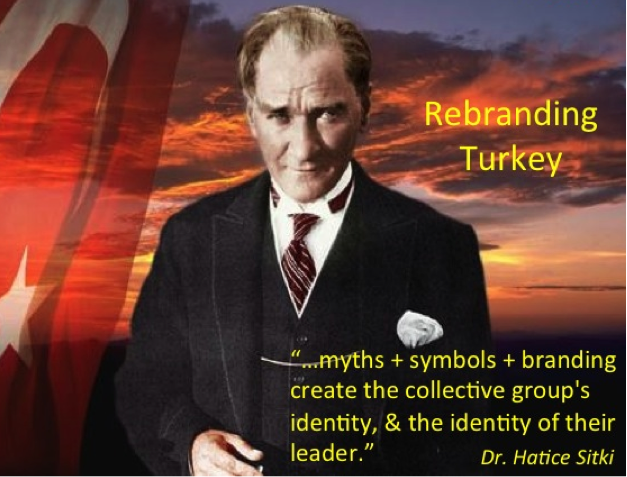 The most interesting part of Hatice’s work was the description of how Kemal Ataturk (literally so renamed as “Father of the Turks) selected from the myths the stories of origins and heroes that existed in Ottoman lore, and recombined them, rephrased them into a discourse, which gave a “real” national identity to Turks. There had been a tribal identity, an ethnic identity for Turks before this, but in the Ottoman Empire there was no sense of a specific Turkish nationality or citizenship. One belonged to the Empire. It was just that way. So Hatice took a look at the marketing of identity not only historically, but also in terms of the future potential of marketing to the EU. She went on to explore how some of the current myths could be rebranded, so that the discourse about Turkey not being really European might be shifted, even integrated with the myths and discourse of European identity. After all, if one really looks at the Ottoman Empire in European history, it’s played a powerful role. It was frequently an ally of European countries against each other. World War I was only the tragic final act in this drama. Yet today Europeans are struggling with, “Can it be a part of Europe? “Can it join the European Union?” European resistance to the idea, among other factors, seems to be fueling a return to stronger Islamic identity after three quarters of a century of existence as a proud secular republic in the Islamic world. When I first explored ideas about the flow of culture in a webinar addressed to a study group of the Project Management Institute, one of the participants from India remarked, “I think there’s a hidden morale in this presentation. At the PMI we need to understand the cultural difference, find common ground for all stakeholders to work as one.” How true, because if we think about image of the river, it’s carrying, integrating all these different waters, from all their different sources into one powerful flow toward the sea, and if we think of ourselves as collaborators in an organization, the diversity that our colleagues bring, whether personal, ethnic, or wherever it originates, as a resource. The metaphor of the river is valid for understanding organizations as well as for exploring group and individual identity. Training multicultural teams to work in global environments, many of whom work almost entirely virtually, requires not only constant exploration of cultural discourse but efforts to shape a “third culture,” the agreed set of discourses by which team members will collaborate. Cultural Detective: Global Teamwork is an example of a tool that was developed by a virtual team to help teams identify and meet the key challenges of virtual collaboration. While such teams often have their own platforms, it is not uncommon for members to use social media to explore and solidify their connections with each other. In an academic context, it happens not infrequently that while students are provided with online tools by the university, many will eschew these for Facebook and other social media when they actually get down to working together on a common project, creating their group culture together on such sites. While we tend to think of deep culture as enduring and resurgent, we should not turn a blind eye to the functional but transitory cultures that are easily built as well as dismantled by new media tools. Even here it is a matter of sharing and shared discourse. If anything, impermanence may be a hallmark of much digital culture where the object of new media utterances is not to “build a monument more lasting than bronze” (Horace, Ode 3.30) but to learn habits that enrich the everyday with timely discourse for what we do to best meet our needs. The river of discourse is a rich, rich resource. We need to know how to tap into its fullness. If not, the likelihood is what I described toward the end of the Culture’s Flow poem. It will flood over us, wash us away. I often think of colonialism and now rampant globalization as the human, cultural equivalent of burning down the rain forests. Most of us only see the destruction of environments from afar, but at the micro level what is going on is the extermination of species or discourse that will not return, resources that might play, in fact, very important roles in our well being. We know that humans have created some very dangerous, even genocidal cultures, discourse about others that enables us to kill them en masse. Yet these realities and their consequences stem from our constructed discourse. Once we realize that we are enmeshed in all of these worlds of discourse, it asks us, how can we look at this, how should we look at what’s real, and, what’s really real may be simply our capacity to recognize different discourses for what they are, stories created in time to serve a purpose, hopefully to serve a good purpose, hopefully to help us succeed and survive in our environment. But so many of them have been dangerous; have been deadly, so it’s about getting the point that realities are ours to create. What do new media bring to this challenge? A great freedom to question. Unparalleled contact with the diversity of others. A great liberty to seek out new discourses of identity. A vast universe of opportunities in which to discover, engage and enroll kindred souls. A limitless playground for new ideas and a place to grow up, space for our discourses to be questioned, to be reshaped, and to be created in unprecedented ways. The opportunity to create a critical mass of discourse that might just change some of the seemingly endless games we have been playing. The tools are there to shape our primitive discourses in ways that will humanely and constructively prevail. This will not happen by itself, nor will the media per se deliver this message. Rather it is we, the storytellers and our intentions, that will make a difference. Do new media guarantee change? Certainly, but not without risks. It is up to us, to our intentionality and our ability to share it that will determine the direction and results of that change. This entry was posted in Core intercultural theory review/history, Research studies and theory and tagged Australia, Cultural Detective, Cultural identity, culture, current events from an intercultural perspective, European Union, multicultural society, new media, Ottoman, Ottoman Empire, Project Management Institute, Turkey, United States, World War by george simons. Bookmark the permalink. Excellent article! As a devout story-listener, I could sit at your feet for ages! Thanks so much for your contributions! Thanks Kelli, though ages is a bit long, after a couple days I start repeating myself!